When I heard about this cute book for young readers I knew I had to have it. And then I was lucky enough to get a copy from Macmillan Kids. <3 And it is so pretty. The book is coming out in May, and I think you all need to check it out. It is adorable. I'm giving it a four star, because I had a few issues with how short it is. While it is so cute, and I love the illustrations, I wish the book was longer. Even just a few more pages with more amazing pictures of that adorable dragon. But even though I wanted it longer, I still really adored it. I'm glad that I read this cute book. This is a short review for me, because there isn't that much I can say about this book. Because, yes, it is pretty short and there isn't that much writing. But there are some gorgeous pictures of this cute red dragon. I loved reading about him. He do a lot of roaring. And he gets scared. 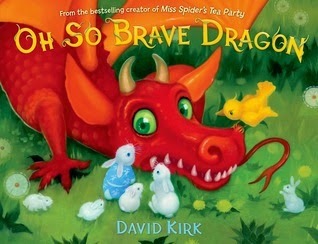 This is about him trying to be brave, and being brave with his friends. I found that to be pretty cute. I enjoyed this short book. Definitely something my kiddos would love! Plus it's about a dragon!!!! TO CUTE! Awwww, it sounds like a super cute book! This book loos adorable! I love that you wanted it to be longer- that says so much. ;) Thanks for sharing. oh my gosh the illustrations are SO cute!